Samantha Bryant (left) and Josh Presley (right) the night after surgery, July 7 2016. 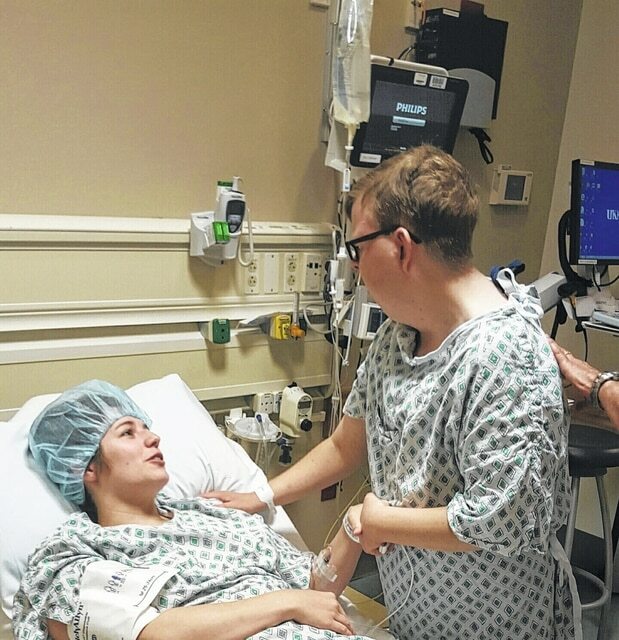 Samantha Bryant and Josh Presley share a moment before surgery, July 7, 2016. Editor’s note: This is the second in a two-part series. The first article ran in last Sunday’s edition of the Community Common. The testing was over. The decision has been made. The moment had finally arrived. Josh Presley and Samantha Bryant were being prepped for kidney-transplant surgery. After the IVs began flowing and the monitors were hooked up, Josh and Bryant had nothing to do but wait. However, as the minutes passed, the anxiety grew. The nervousness and anticipation grew even further when an emergency forced a delay in Josh and Bryant’s surgery. During that delay, with Josh and Bryant in adjacent beds, Josh got out of his bed, went to see Bryant and gave her a hug. With their anxiety overwhelming them and tears pouring down their faces, Bryant and Josh shared one last embrace before undergoing the life-altering transformation. “It was a really touching moment,” Rick Presley, Josh’s father, said. Donating her kidney was the first real surgery Bryant has ever undergone, besides wisdom teeth removal. In comparison, Bryant said Josh was about to undergo his seventh surgery. After the embrace, Josh found himself waiting anxiously while Bryant was in surgery, risking her health to give Josh that life he so desperately craved. After approximately 45 minutes, it was Josh’s turn to enter the operation room. Once again, fear and anxiety began to overwhelm a young man who had spent more than a year dreaming of this moment. Josh’s surgery lasted almost four hours. Once Robin and Rick Presley were able to see their son, the first words out of his mouth were almost predictable but also demonstrated the struggles Josh had faced over the past six years, “Is it over and what is my GFR (Glomerular Filtration Rate),” Josh asked his parents in his groggy state. The question flabbergasted his parents. “Who would wake up out of surgery and say, ‘What’s my GFR?,’” Rick said. Bryant, who had laparoscopic surgery, only had to stay in the hospital for three days. On her final day, as she was being released, Bryant went to see Josh. She entered the room in a wheelchair and stopped by the side of Josh’s bed. He couldn’t turn his neck very well because he had a central line in place, which restricted his movement. Josh believes Bryant is his angel and God sent her to save him, but while Bryant doesn’t feel like an angel, she has already agreed to give Josh other organs as needed. “It makes me feel embarrassed. It’s just the sweetest thing. I told him I’d be happy to do it all over again whenever he needs a lung,” Bryant said jokingly. Whether the family debate on the importance of Bryant’s sacrifice ever gets settled remains to be seen, Bryant believes Robin would have found a way to save Josh’s life — one way or another. Thanks to Bryant, Josh finally has his life back. After being placed on a strict diet for the past six years, Josh can finally eat normal food, which is something he doesn’t take for granted. His first experience came the night after his surgery. Josh was placed on a clear liquid diet, which included jello. They brought him strawberry jello. He was hesitant at first to try jello because it wasn’t part of the special diet he had grown accustomed to as his old kidney continued to deteriorate. His parents were anxious also but they told Josh to try the jello. Josh took a bite of that jello and he busted out crying. Josh hadn’t enjoyed any type of sweet substance in years and as his old kidney continued to get worse, his diet became even more strict. But now, he was getting to enjoy the taste of food all over again — and it was overwhelming. “He just busted out crying over jello of all things,” Rick said. Once he was discharged from the hospital, his first dinner at home was spaghetti and to Josh, the sensations were new but the feelings were old: they took him back to a place where he felt normal again. Every time he picks up a glass of milk or anything sweet, he has a brief moment of anxiety from years of regulations, but once the substance touches his taste buds, his face illuminates with joy. The last six years have also taken their toll on Robin too. She has been so restrictive on Josh, trying to keep him healthy, now she gets to spoil her son once again. The major disagreement has been over chips and salsa, which has been something Josh has long desired to taste. The first time he bit into one after his surgery, he couldn’t believe the taste. Now, Robin keeps extra chips and salsa on hand for whenever Josh comes looking for a midnight snack. “Whenever he says, ‘Chips and salsa mom,’ I’m like, I gotcha,” Robin said jokingly. With Bryant’s donation, Josh not only got his life back, he was able to stay alive. He’ll never forget who made that possible. “She’s my angel,” Josh said.